Recent technological innovations such as functional neural stimulation (FNS) offer considerable benefits to paralyzed individuals. FNS can produce movement in paralyzed muscles by the application of electrical stimuli to the nerves innervating the muscles. The first part of this talk will describe how smooth muscle movements can be evoked using Utah slanted electrode arrays (USEAs) inserted into the motor nerves of the peripheral nervous system. The standard 4 x 4 mm USEAs contain 100 electrodes of varying lengths. Implantation of a USEA in a peripheral nerve allows highly selective electrical access to individual and small groups of axons. We will review approaches for designing asynchronously interleaved stimulation signals applied via individual electrodes in the arrays to evoke smooth, fatigue-resistant force that closely resembles normal motor function. The second part of this talk will describe efforts to decode cortical surface potentials, recorded with dense grids of microelectrodes. Decoding human intent from neural signals is a critical component of brain-computer interfaces. This information can then be used to control the muscles in tasks involving restoration of motor skills or to control a robot that performs desired tasks. We will discuss recent work on decoding neural data collected from patients implanted with microelectrode arrays. The talk will conclude with a discussion of some of the current research challenges in this area. Biography: Dr. V. John Mathews is a Professor of Electrical and Computer Engineering at the University of Utah. His research interests are in nonlinear and adaptive signal processing and application of signal processing techniques in audio and communication systems, biomedical engineering, and structural health management. He chaired the department of Electrical and Computer Engineering at the University of Utah during 1999-2003. Dr. Mathews is a Fellow of IEEE. 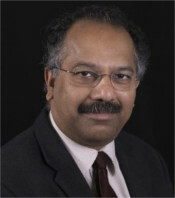 He served as the Vice President (Finance) of the IEEE Signal Processing Society during 2003-2005 and the Vice President (Conferences) of the Society during 2009-2011. He is a past associate editor of the IEEE Transactions on Signal Processing, and the IEEE Signal Processing Letters and the IEEE Journal of Selected Topics in Signal Processing and currently serves on the editorial board of the IEEE Signal Processing Magazine. He was a recipient of the 2008-09 Distinguished Alumnus Award from the National Institute of Technology, Tiruchirappalli, India, and the Utah Engineers Council's Engineer of the Year Award in 2011. He serves now as a Distinguished Lecturer of the IEEE Signal Processing Society for 2013 and 2014. Chris discussed his research on understanding how anthropogenic factors affect the behavior, energetics and survival of wildlife. He has installed RFID tracking devices on a number of bird feeders in both populated and unpopulated areas around the Madison area. He utilized tiny RFID devices that were attached to the legs of wintering birds in the area. The tiny devices had to be a small fraction of the weight of the birds, no small feat for chicadees weighing about 15 grams. Under the assumption that one RFID tag hit represented a single seed removed to a surrounding tree to eat, he could estimate the caloric intake for the bird and relate it to survival. He also reported on similar studies that identified social cliques among wintering birds. Chris's talk highlighted technology that is now commonly applied to wildlife studies and made it clear that the use of technology will increase in the future. Dr. V. John Mathews' visit on March 14th is an opportunity for those Madison IEEE Section members interested in his research. His lecture in Madison is the last stop on a tour that includes Minneapolis and Rochester, Minnesota and Ames and Iowa City, Iowa. Because of his travel schedule, the meeting is the second FRIDAY, not our usual third-Thursday of the month. Dr. Mathews' lecture series is in part sponsored by the IEEE Signal Processing Society through its Distinguished Lecturer Series. His visit also coincides with a visit from Alkesh Patel, IEEE Region 4 Central Area Chair. Alkesh will be joining us at the meeting to learn about the IEEE Madison Section and to help us with IEEE Section management. Alkesh has been an active member and officer for the IEEE Rock River Section adjacent to our southern border. The IEEE-Madison Section has been approached by INCOSE (Link Here), the International Council on Systems Engineering, Chicagoland Chapter to participate in joint activities. According to the web site, their mission is "to share, promote and advance the best of systems engineering from across the globe for the benefit of humanity and the planet". According to INCOSE members, the potential IEEE Societies of common interest are Aerospace and Electronic Systems, Circuits and Systems, Control Systems, Components, Packaging, and Manufacturing Technology, Engineering in Medicine and Biology, Intelligent Transportation Systems, Product Safety Engineering, Reliability Society, Systems, Man, and Cybernetics and Vehicular Technology. Please contact Tom Kaminski (email address below) if you are interested in organizing joint activities with INCOSE. The third Thursday of Jananuary through May and September through December is reserved for a meeting to provide recent research, developments, trends and/or innovations in one of our membership's technical areas. The IEEE-Madison Section of the IEEE is a section in Region 4 of the IEEE-USA organized to serve IEEE members in the Madison, WI area with over 600 members. the 2014 Officers and Board Members are Tom Kaminski - Chair, Steve Shultheis, Vice Chair, Charles Gervasi - Treasurer, Brandon Zemlo - Secretary, Timothy Chapman - Webmaster, Tom Kaminski - ECN Chair, Members at Large: Mitch Bradt, Clark Johnson, Dennis Bahr, Craig Heilman, Sandy Rotter.